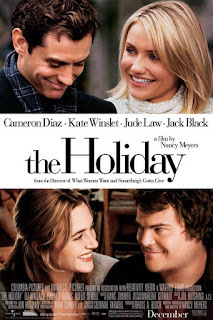 The Holiday tells the heart-wrenching story of unrequited love, specifically that between the producers of this movie and the film, Love Actually. You see, the people who made The Holiday watched Love Actually, loving its success from afar for three long years. But The Holiday's producers were American, largely based in California, a world apart from the English production they so desired. The Holiday is an allegory for this passionate love, told with two crossing stories centered on women who trade homes - one in Los Angeles and the other in the English countryside. "Why only two?" you might ask. After all, Love Actually juggled nine tales of romance. Presumably the people behind The Holiday partially understood their limitations and decided to aim for something more manageable. Unfortunately, two-ninths still proved an overly-ambitious goal. The worst sections of Love Actually still manage to deliver escapist romance that's orders of magnitude better than what The Holiday offers. But they tried so hard. The movie opens with a reflection on the vastness of love, just like Love Actually. EXACTLY like Love Actually, one might say - I really can't overstate just how reminiscent the prologue was. But the character delivering the speech, Iris (played by Kate Winslet), is in shambles. The man she loves, a smarmy, manipulative jerk, is getting ready to marry someone else. After a light and silly flirtation with suicide, she discovers she's received a message from LA: Amanda (Cameron Diaz), who produces movie trailers and just broke up with her cheating boyfriend, found Iris's house listed on a house exchange, and the two agree to swap for the Christmas holiday. Iris books a flight for the next day, because apparently it's very easy to get cheap, last minute airfare right before Christmas. She's ecstatic to discover that she's staying in a massive mansion in downtown LA. Amanda's less enthused, but her outlook improves after sleeping with Iris's brother, played by Jude Law. Iris meets a couple of men who change her life: Arthur, an elderly Hollywood writer who she befriends, and Miles, a composer played by Jack Black. While the 90-year-old Arthur might have made for a more interesting love story, they went with Black. Both stories include the standard twists and turns, including Iris's ex flying to LA to try and rekindle their relationship despite his engagement, and the revelation that Jude Law has kids and is a nurturing, caring, single father. But, of course, love conquers all. Except really crappy writing and directing: love actually loses that battle. If there's a tragedy here, it's that the actors were really, really good, almost without exception. You'll note I said "almost." That's due to Cameron Diaz, who treats her role like comic relief, despite the fact that's not remotely the movie's tone. Even Jack Black shows restraint in this. To be fair, she had the least to work with. Her character's central trait is that she hasn't cried since high school. She's incapable of crying, until Jude Law teaches her to be human (at which point she starts crying, renounces her programming, and finally decides not to kill Sarah Connor). Kate Winslet did better work, but her character arc was only slightly better written. In her case, she tells off the guy she'd been pining for, who bizarrely sits still listening to a minute-long monologue about how he's a horrible person. She's right, of course, but it's utterly unbelievable he'd just sit around with a semi-interested yet unengaged expression without attempting to defend himself. Oh, then she runs off to help the old screenwriter be honored. There are countless problems with this film I'm glossing over. The first half is astonishingly boring, the characters are under-developed, and the jokes are rarely funny. But I want to take a moment and highlight something that really jumps out at me about this: its depiction of women. The only female characters given more than a minute or two of screen time are the two leads, one of whom is pathetic, while the other is a soulless machine sent from the future. They're neither likable nor interesting people. While it's true their exes are portrayed as worse, the other men in the movie all come off as absurdly perfect. We're left with the impression that men - at least some of them - are rational, loving, and complex, while women are just crazy. For something written and directed by a woman, the movie feels oddly misogynistic. That's a common issue with romcoms, of course (at least the bad ones). But it's especially blatant in The Holiday, due to the three lead men (I'm counting the 90 year-old writer) being ridiculously wonderful. I sincerely doubt Nancy Meyers is actually a self-loathing misogynist, but the movie winds up feeling that way as a side-effect of profoundly lazy writing. To be fair, The Holiday gets a little better in the second half, when the love stories pick up. But overall it's an extremely unpleasant movie to watch. Over the past few years, a lot of people have taken up the pastime of whining about Love Actually's shortcomings. I think sitting through this knock-off should be a prerequisite for complaining about how Love Actually is overrated.